Saudi Arabia aims to generate SR35 billion to SR40 billion ($9 billion to $11 billion) in non-oil revenues from its privatisation programme by 2020 and create up to 12,000 jobs, according to a document published by the official Saudi Press Agency. The initiative targets 14 public-private partnership (PPP) investments worth SR24 billion ($6.4 billion) to SR28 billion ($7.4 billion). 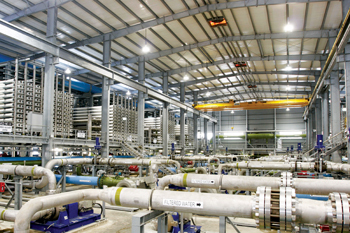 It includes the corporatisation of Saudi ports and the privatisation of the production sector at the Saudi Saline Water Conversion Corp (SWCC) and the Ras Al Khair desalination and power plant, the document showed. The government has said it plans to raise about $200 billion through privatisation in coming years as part of “Vision 2030” reforms that aim to transform the economy of the world’s top oil exporter. It separately wants to raise another $100 billion through the sale of a five per cent stake in Saudi Aramco. “The privatisation programme aims to strengthen competition, raise the quality of services and economic development, improve the business environment, and remove obstacles that prevent the private sector from playing a bigger role in the kingdom’s development ...” Economy Minister Mohammed Al Tuwaijri said in a statement. The document released charts the way forward for the period ending in 2020, during which the government plans to privatise the national football league, flour mills at the General Silos and Flour Mills Organization and part of SWCC. It will also work on corporatising ports, privatising some services in the transportation sector, and transforming King Faisal Specialist Hospital and Research Centre into a non-profit organisation. Most processes will be limited to corporatisation and preparatory procedures, with full privatisation not expected before 2020, according to the document. The government also plans to introduce a new indicator to evaluate the privatization process in each target sector based on the number of bids submitted by the private sector and their value compared with the original financial value. The full programme has over 100 potential initiatives in more than 10 sectors. It targets SR60.99 billion in non-government investments by 2020 with a goal of contributing up to SR14 billion to gross domestic product (GDP) and up to SR33 billion worth of savings in the government’s capital and operating expenses from PPP investments. John Sfakianakis, a former adviser to the government and director of economic research at the Jeddah-based Gulf Research Center, called the delivery plan an important milestone. “Privatisation would improve efficiency and productivity, internally, allowing the kingdom to employ all material and human resources,” he said.